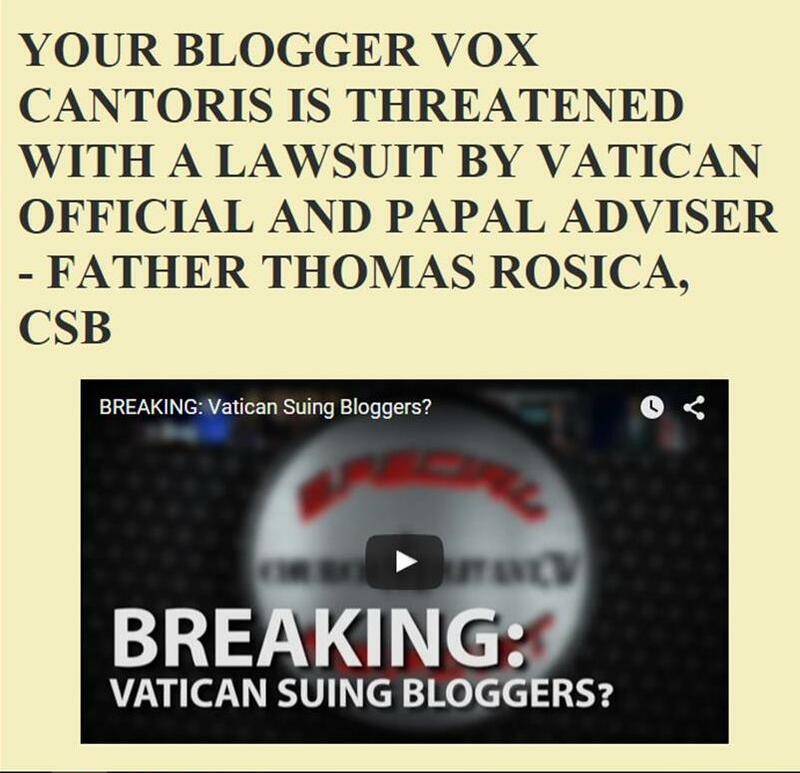 Vox Cantoris: Does no one care for his soul? Does no one care for his soul? This is not for the faint of heart. Some Catholics may find this scandalous. In spite of all the insults to Catholics, the name-calling, the insinuations, the mocking of faith, the berating to get with his program, the division and marginalisation, the three years of chaos and all the commentary, nothing; nothing has been as direct and real as this from Hilary White. This pope, apparently hardened in his wicked ideology, is a habitual blasphemer, and, I will dare to say, given his apparently unshakable belief that these assertions are true and opposed to the teaching of the Church, is a wanton heretic, someone who believes himself to be above the Law of God, indeed, to have the power to overturn it at will. Pope Francis has decided that “the Spirit” is telling him and his followers that these words of Jesus Christ are void. That the words and commands of the Author of Life no longer apply. They are outdated. They are hard and unforgiving, unmerciful. Therefore, anyone who still wants to adhere to the teaching and commands of Jesus Christ are “resisting the Spirit”. And he blasphemously demands that we be “docile” to this monstrosity. Is there a Catholic left who would hear those words, and stand up, and say, “Holy Father, that’s blasphemy! That’s heresy! You must not commit such a horrible sin!” Does no one care for his soul? Will no one spare a thought for the terrible condition that awaits him in the next life? Or call for him to repent and avoid it? I will. I hope and pray, for the love of his soul and for the love of Christ, that others will too. According to St. Robert Bellarmine and Vatican I, there had never been an heretical Pope up to their times. Saint Robert considered this fact akin to a sign from heaven that a true Pope is protected from becoming a manifest heretic. An heretical Pope would obviously make nonsense of the dogmas of Papal Infallibility and the Indefectibility of the Church. "St. Jerome says: «Why shouldn’t I report of things which others do not blush to do?» And St. Gregory the Great writes: «It is better that scandal arise than that truth be concealed.» Even St. Thomas Aquinas says: «There being an imminent danger for the faith, prelates must be questioned, even publicly, by their subjects.» Our Lord Jesus Christ adds: «Who does not have a sword, sell his cloak and buy one.» (Luke 22, 35-36). I remember, here, the cry of St. Paul: «Beware of the dogs.» (Phil. 3: 2-3). Today, even the Church of Vatican II is full of dogs. St. John, the beloved of Jesus, has even written: «If anyone comes to you and does not bring this teaching, do not receive him into your house nor greet him.» (2 Jn. 10) Today, however, the subverters of the doctrine of Christ, are not only greeted but also welcomed into the home, into the Church, and are honored and awarded with prestigious positions, although they are poisoners of souls and protesters of every “Truth” which in [the] past, were always believed. Therefore, my position was always a “crusade” even for the right to remonstrate, for the right to be able to fulfill my duty as an “alter Christus,” to proclaim, in fact, the “Truth.”"
I have been interested in the Shroud of Turin for years. It is the most intensively examined artifact on Earth, and there is no longer any reasonable doubt as to its authenticity. Crucified persons die from asphyxiation. Their diaphragm is splinted and they have to lift themselves upward, by pulling on their arms, or pushing upwards on their feet, to be able to breath. Professor Juan Manuel Minarro of the University of Seville, created a sculpture of Our Lord according to exact information gleaned from the shroud. This is a must see to properly comprehend the physical severity of the Passion. "This Christ is the result of the work of a multidisciplinary team of scientists who are researchers of the Shroud. It is the only Shroud-based Crucifix in the world and it reflects, up to the last detail, the multiple traumatisms of the corpse, as they are reflected in the Shroud of Turin. The image represents a body, 1.80 m tall, according to the studies of the Shroud by the universities of Bologna and Pavia. The arms and the cross form a 65 angle. In it, the wounds of the Man in the Shroud of Turin are reproduced exactly." I would have gone the whole hog on this and left out the loin cloth in the interests of authenticity. The stripping of Our Lord's garments at the tenth station was an intentionally inflicted gross humiliation. I can think of five anatomical reasons why nothing shocking to Victorian eyes would have been visible. The Shroud demonstrates that the right shoulder was dislocated. The Gospel tells us that He gave a loud shout just before He died. Dislocation of the shoulder is very painful and I think the dislocation caused the loud shout of pain and no longer able to pull Himself up to breath, Our Blessed Lord died. Now for the stunning bit! Note in the painting that the right arm is taughtly stretched, while the left is slightly flexed at the elbow - Our Lord was crucified asymmetrically. See the right pectoral muscles are elevated much beyond the left. This conforms with the Shroud - dislocation of the right shoulder. How did an African artist know that? In the Dolorous Passions of Our Lord Jesus Christ, Blessed Anne Catherine Emmerich was quite clear that Our Blessed Lord was naked, completely. This was part of the total humiliation inflicted by the Romans. He was a "worm" as He said in the Psalm and treated as such. I cannot recall if she named the person, but a Centurion gave permission for one of the women to wrap a loin cloth around him after he had been raised. We also now have a scientific investigation proving the the Sudarium in Spain is of the same "man" on the Shroud. How would Hilary respond to Cardinal Burke's statement ? Even Dr.Joseph Shaw at LMS Chairman says Pope Francis is not in heresy and that Amoris Laeitia is in accord with the contemporary official theology. Could Pope Francis and Cardinal Schonborn be using the same moral theology as Cardinal Burke and Prof. Joseph Shaw ( LMS Chairman)? Would you agree with the following blog post I asked Hilary but she said nothing. Cardinal Schonborn could respond to Christopher Ferrara saying,'You accept the new moral theology, like Cardinal Burke, so why are you complaining ? This reasoning is irrational however it is being used in the new theology on faith and morals.This is the moral theology of Pope Francis. Amoris Laetitia is based on personally knowing exceptions to the traditional teaching on mortal sin.This is objectively false. Steve Skojec, why do you say doctrine has not been changed? they interpret EENS and Vatican Council II with Cushingism. Heresy in Amoris Latitiae ? Cardinal Raymond Burke and Prof. Joseph Shaw assume hypothetical factors or theories are explicit exceptions to the traditional de fide teaching on faith and morals. Cardinal Raymond Burke and Prof. Joseph Shaw both assume hypothetical factors or theories are explicit exceptions to the traditional de fide teaching on faith and morals. So with this heretical theology they interpret Vatican Council II as a break with Tradition.A rupture with the dogma extra ecclesiam nulla salus(EENS). They also accept Amoris Laetitia n.301 when it is a break with Tradition.It is a rupture with the traditional understanding of mortal sin. If they say hypothtical factors or theories are not explicit exceptions to the traditional teaching on faith and morals, they will be affirming the 'rigorist' interpretation of the dogma EENS and also traditional mortal sin. This would place them in conflict with the 'contemporary official magisterium' which also assumes hypothtical factors and theories, are objective. This would be telling the whole world that non Catholics are oriented to Hell without 'faith and baptism'(AG 7, LG 14) in the Catholic Church and that so many well known people are in mortal sin and that there are so many ecclesiastics committing sacrilege. So they will use the false reasoning, and accept the new theology, 'interpreting Church documents in light of the whole tradition of the Church...' which assumes hypothetical factors and theories are known exceptions to Tradition. They are a rupture with Tradition on faith and morals.In this way there is no tension with the magisterium and the influential political Left. Did the Pharisees not also change the Word of God on marriage ,allowing divorce ? I hope 2017 won't be too late to let him know his errors while visiting Indonesia, especially my Hometown, Pontianak.